The student work is visually beautiful, much of it accompanied by cogent explanations written by the students (who ranged from freshmen to juniors). So what are name cards, you wonder? These are simply standard tent cards of the sort you see at conferences, except that the students wrote their names in hieroglyphics. On Day One they did that with the aid of the hieroglyphic alphabet bookmarks that each received. (See image on the right.) Of course the quality of the student art work varied enormously, but everyone tried their best, and this was never meant to be an art course. The difficulty, however, is that the bookmark is only about 50% accurate (an important lesson there). It can’t be fully accurate, as Egyptian hieroglyphics do not match our 26-letter alphabet. In fact, they aren’t an alphabet at all. 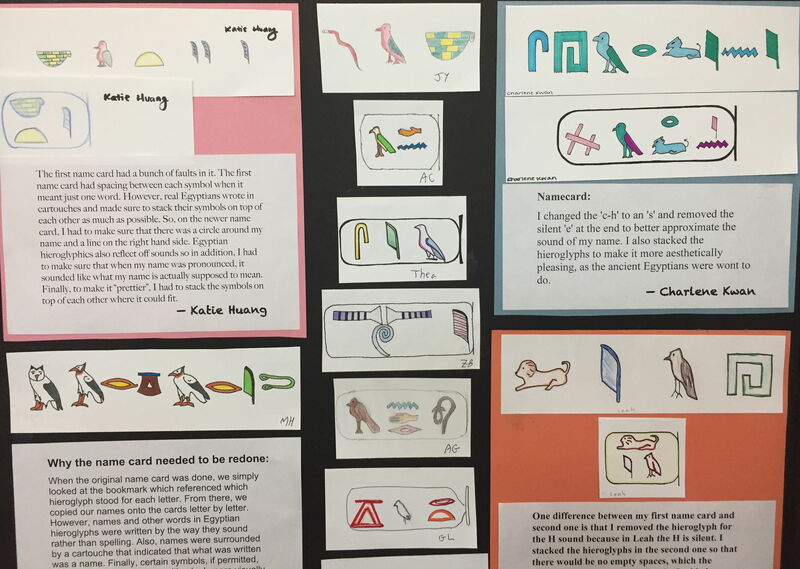 As my students learned, some hieroglyphs represent sounds, but many don’t. Some represent pairs of sounds, or triples (like nfr), and some represent meanings, like a sparrow for small. And even the sounds are only consonants; Egyptian (like Hebrew and Arabic) didn’t record vowels at all. Whew! So, on Day Two the students made new name cards, and some volunteered to explain what they did and why, as you can see in the image above. 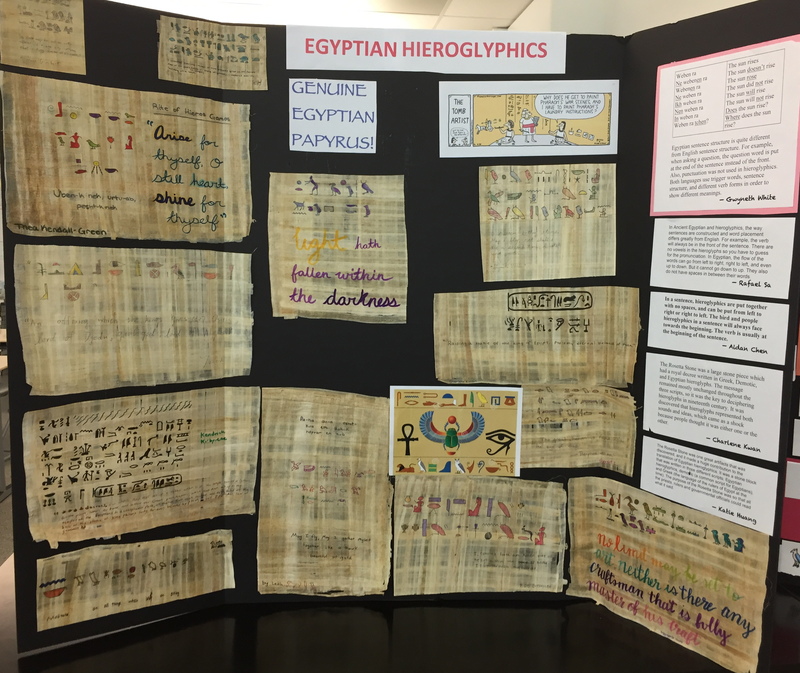 We also got to write on genuine Egyptian papyrus, as seen in the images below, showing some of the inscriptions that many of the students wrote. You can also see (on the right of the image) some of their explanations of Egyptian word-construction and the grammar of basic sentence order. We did a lot in 15 hours! Finally, how could we avoid doing some math? Of course we couldn’t! So we spent a small amount of time on the amazing method that the ancient Egyptians developed for multiplying numbers without having to memorize multiplication tables (write-ups by some students on the posters), and on the unusual way the ancient Egyptians wrote fractions as sums of distinct unit fractions only, so 3/5 had to be written as 1/2 + 1/10 (more write-ups on the posters).